AWS Directory Service for Microsoft Active Directory (Enterprise Edition), also known as AWS Microsoft AD, now supports Microsoft Remote Desktop Licensing Manager (RD Licensing). By using AWS Microsoft AD as the directory for your Remote Desktop Services solution, you reduce the time it takes to deploy remote desktop solutions on Amazon EC2 for Windows Server instances, and you enable your users to use remote desktops with the credentials they already know. In this blog post, I explain how to deploy RD Licensing Manager on AWS Microsoft AD to enable your users to sign in to remote desktops by using credentials stored in an AWS Microsoft AD or an on-premises Active Directory (AD) domain. To use RD Licensing, you must authorize RD Licensing servers in the same Active Directory domain as the Windows Remote Desktop Session Hosts (RD Session Hosts) by adding them to the Terminal Service Licensing Server security group in AD. This new release grants your AWS Microsoft AD administrative account permissions to do this. As a result, you can now deploy RD Session Hosts in the AWS Cloud without the extra time and effort to set up and configure your own AD domain on Amazon EC2 for Windows Server. 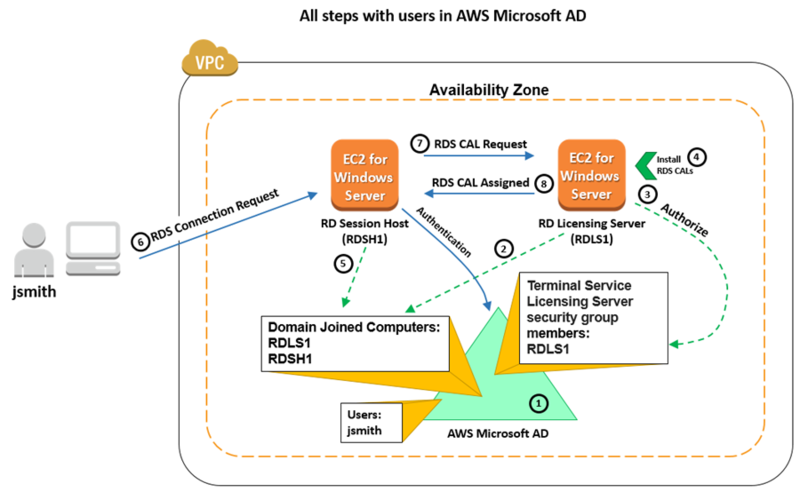 The following diagram illustrates the steps to set up remote desktops with RD Licensing with users in AWS Microsoft AD and shows what happens when users connect to remote desktops. Create an AWS Microsoft AD directory and create users in the directory. You can add user accounts (in this case jsmith) using Active Directory Users and Computers on an EC2 for Windows Server instance that you joined to the domain. 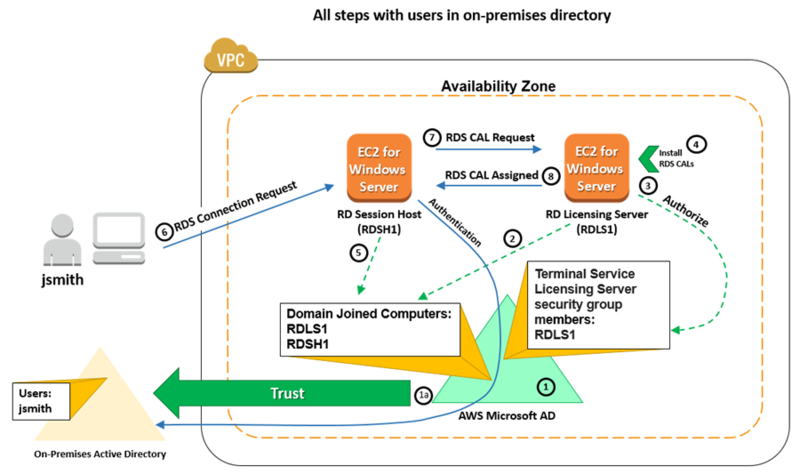 Create EC2 for Windows Server instances to use as your RD Licensing servers (RDLS1 in the preceding diagram). Add the instances to the same domain to which you will join your Windows Remote Desktop Session Hosts (RD Session Hosts). Configure your EC2 for Windows Server instances as RD Licensing servers and add them to the Terminal Service Licensing Servers security group in AWS Microsoft AD. You can connect to the instances from the AWS Management Console to configure RD Licensing. You also can use Active Directory Users and Computers to add the RD Licensing servers to the security group, thereby authorizing the instances for RD Licensing. Install your Remote Desktop Services client access licenses (RDS CALs) on the RD Licensing server. You can connect to the instances from the AWS Management Console to install the RDS CALs. Create other hosts for use as RD Session Hosts (RDSH1 in the diagram). Add the hosts to the same domain as your RD Licensing servers. A user (in this case jsmith) attempts to open an RDS session. The RD Session Host requests an RDS CAL from the RD Licensing Server. The RD Licensing Server returns an RDS CAL to the RD Session Host. Because the user exists in AWS Microsoft AD, authentication happens against AWS Microsoft AD. The order of authentication relative to session creation depends on whether you configure your RD Session Host for Network Level Authentication. If you have an on-premises AD domain with users, your users can open remote desktop sessions with their on-premises credentials if you create a forest trust from AWS Microsoft AD to your Active Directory. The trust enables using on-premises credentials without the need for complex directory synchronization or replication. The following diagram illustrates how to configure a system using the same steps as in the previous section, except that you must create a one-way trust to your on-premises domain in Step 1a. With the trust in place, AWS Microsoft AD refers the RD Session Host to the on-premises domain for authentication. In this post, I have explained how to authorize RD Licensing in AWS Microsoft AD to support EC2-based remote desktop sessions for AWS managed users and on-premises AD managed users. To learn more about how to use AWS Microsoft AD, see the AWS Directory Service documentation. For general information and pricing, see the AWS Directory Service home page. If you have comments about this blog post, submit a comment in the “Comments” section below. If you have implementation or troubleshooting questions, please start a new thread on the Directory Service forum.